High surface area titania lyogels have been prepared, thermally transformed into TiO2 polymorphs at 400–850 °C, and decorated by ball milling with preformed Au nanoparticles of ca. 2 nm to ensure the same contact points at the metal–support interphase. The best performance in the photogeneration of hydrogen from gaseous water–ethanol under dynamic conditions in a fixed bed reactor has been obtained with the lyogel calcined at 550 °C, with a hydrogen photoproduction rate of 19.8 mmol H2 g−1 h−1 under an irradiance of 80 mW cm−2 and GHSV = 26 000 h−1. This photocatalyst contains 84% anatase and 16% rutile polymorphs, very similar to the standard P25. 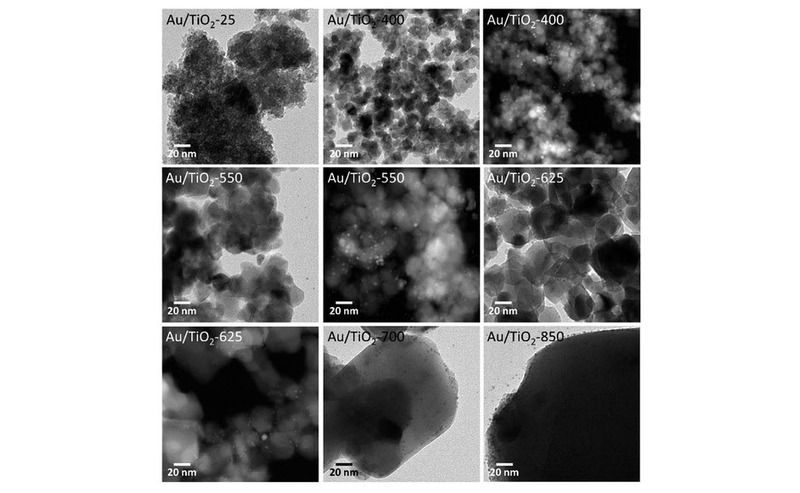 A series of photocatalysts prepared by lyophilization of a mixture of the titania gel and the preformed Au nanoparticles and calcination under the same conditions has resulted in samples with Au nanoparticles up to 18 nm strongly interacting with TiO2. The presence of Au nanoparticles in the composite lyogel has strongly retarded the transformation of anatase into rutile. The results have shown that the TiO2polymorph has a greater influence than the Au nanoparticle size on the photoproduction of hydrogen.